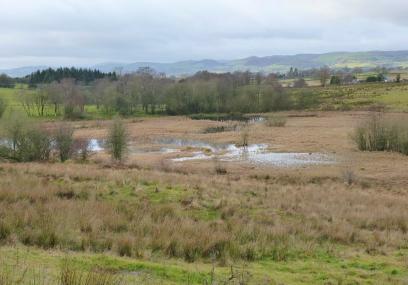 A mixture of habitats including standing water, mire, swamp, wet woodland and both wet and dry grassland. A wide variety of habitats including open water, mire, wet woodland and wet and dry grassland all within a small area. Bird species include bullfinch, skylark, linnet, reed bunting and song thrush which have all declined drastically in the British Isles. All three species of woodpecker have been observed in the wooded areas, and overhead red kite, buzzard and raven patrol. In winter the reserve is an important roost site for large numbers of snipe, jack snipe and pied wagtail. Interesting species associated with the water and aquatic vegetation include water rail, sedge warbler, kingfisher, and specialist invertebrates such as the water ladybird Anisosticta 19-punctata, water scorpion Nepa cinerea, and a very scarce small black rove beetle Stenus oscillator which is particular to marshy places. During summer many species of insects emerge including azure damselfly Coenagrion puella, common and southern Hawker dragonflies Aeshna juncea and A. cyanea along with wetland craneflies and hoverflies. The thistles on the drier slopes provide a food source for goldfinches, and meadow brown butterflies, and the grassland is also good hunting ground for owls. Mammals prove more difficult to view, but water vole, brown hare and polecat have all been known here. Frogs and smooth newts can be found among the sedges, northern marsh-orchids, broad-leaved cotton-sedge and bog violets growing on the damp soils. Pentrosfa mire's rarest species is a lichen discovered on willow twigs which is new to science (a member of the Arthonia genus). Over 100 species of lichen have been found on this reserve. Boardwalks provide access across the wetter areas.